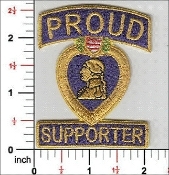 Our one of a kind 3d Purple Heart For Military Merit coin. 1 3/4" Solid Brass 3D, designed and created by our company to Honor You. 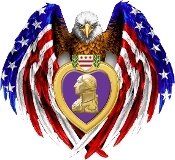 Our 3D National Military Order of the Purple Heart Challenge Coin Designed to be used by Chapters and Departments to Present to Special individuals or Business Owners that Support you.. Discounts available for package purchases. MOPH Table Runner Digital Printed Banner "Home of the Free"